There’s a high degree of bias that comes to mind when people think of the trumpet. From that overly macho guy you knew who played it in high school to players of distinction, it’s generally received as an instrument that will not only play the melody, but will physically shove it down your ear drum. Just think for a second of all the dynamic trumpeters you know who aren’t Miles Davis. Do many others come to mind? If you’re a bit lost on the question, it’s time you tuned your ears to the talents of Brandon Ridenour. At the age of 20, he joined The Canadian Brass, a hallmark group of modern players with exceptional abilities. With them, he tackled another unfortunate trope of the trumpet: the idea that one can only be a great trumpeter if they can play “Flight of the Bumble Bee” at the proper tempo. Speaking with Ridenour last month, I asked him if he had any other benchmarks for quality trumpet playing besides “Bumble Bee.” “What would really impress me is if a trumpeter could play it in any key,” he says after a laugh. Although hearing the piece in a major key would be exceptional, Ridenour has aspirations beyond subduing outdated standards. I felt a little bad fixating on an album that had been released in 2014, but it’s too beautiful a work for me to not want to discuss with its composer. Not only is the music affecting, but it has a boundlessness to it as the songs blend seamlessly into one another, which Ridenour and I both agree is a phenomenal way to perform given that life itself acts in this way. In the dreamlike state that Fantasies conjures, the thoughts and melodies of dreams stretch out to near infinity. Ridenour expanded upon how Useful Chamber works considering how many instruments and talents appear on a single song. 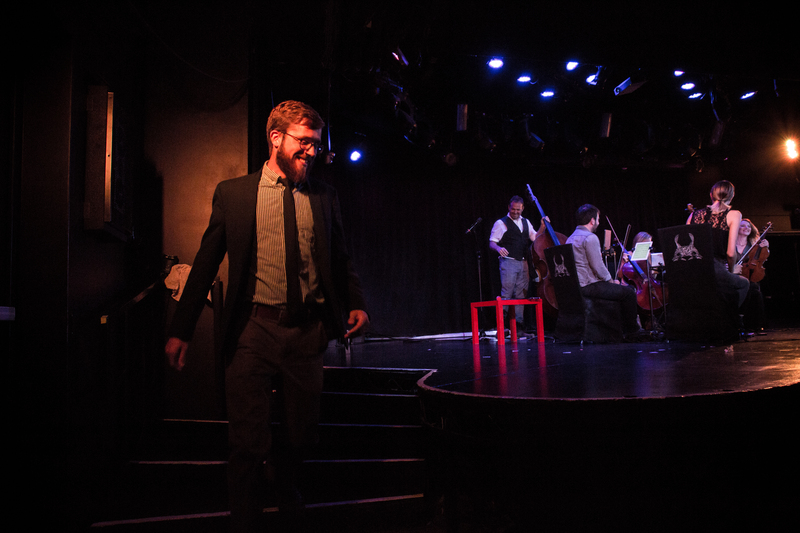 You’ll find full string sections, multiple drummers, and a cabal of background singers and classically trained performers, all performing pop songs as arranged by Ridenour. “On paper, it might sound totally weird and self-absorbed, working with these composers that have nothing to do with one another. It shouldn’t work. In all honesty, it’s a terrible idea!” His humble laughter is one of his best qualities, but the project puts out material that is definitely worth bragging about. For example, A Dream Within A Dream is the most fully-realized work the project has produced. Ridenour and some two dozen other players put pop songs through a filter of noble, acoustic instruments. “The pop world is getting more electronic-based, and we’re losing the sound of natural instruments.” Here, Ridenour is giving back to classical music, whose modern appeal might lie in the glamorous Mozart in the Jungle instead of Mozart the original. “It’s more about the drama than the actual music,” laments Ridenour. That all being said, Ridenour is far from the kind of person who’s resolved to complain. Through projects like Useful Chamber, he strives to reconcile the antiquated notion that an opera or recital is going to be too boring to stay awake for. He takes from the jazz and pop world only the elements that are needed to place orchestral music on a higher plane: “Whether you’re conscious of it or not, things just flow from one thing to the next. You’re never really in one place then just immediately in another… Life has more connecting flow from one event to another.” With such a worldview, it’s easy to see how his compositions are so good. To bring up Miles again, who seamlessly dovetailed modal jazz and blues, Ridenour is taking a dialogue about classical music and moving it into a room where Sketches of Spain and Yes’ Close to the Edge are playing simultaneously. It seems an awkward transition at first, but looking through the cracks provides a lot of creative common ground for any arrangement. “There are people that ask me ‘Do you really go to classical music concerts?’ They’re worried they’re going to get bored.” With the creative juxtapositions Ridenour has spent the better part of a decade constructing, both musically and affectionately, it becomes easy to see more of classical music’s lasting power than your perfunctory holiday pops concert. His compositions prove that the trumpet, and classical music at large, have a greater place outside their stereotypes. These are instruments of nobility. They make contributions solely in service of artistic expression, no matter what genre is at play.